The Advocacy Alliance of Susan G. Komen for the Cure® uses the power of activism to achieve important legislative objectives at federal, state and local levels. 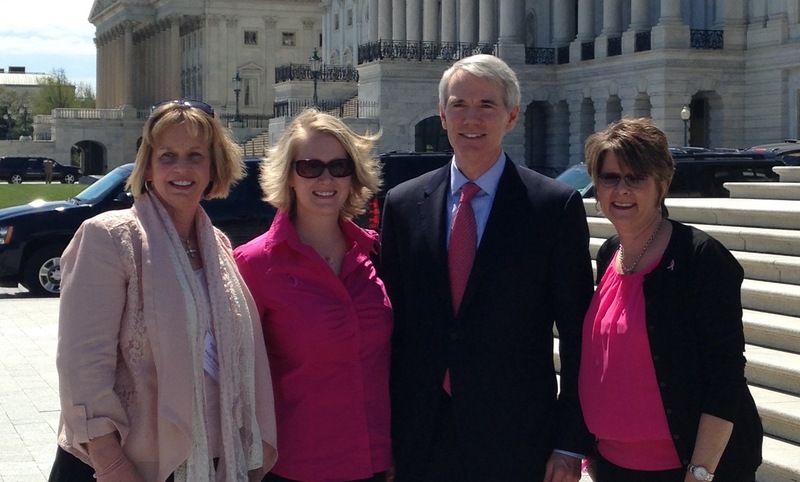 Three women from the Greater Cincinnati Affiliate put that activism into practice as they joined Komen Advocates from all over the country to spend the day on Capitol Hill lobbying their legislators. 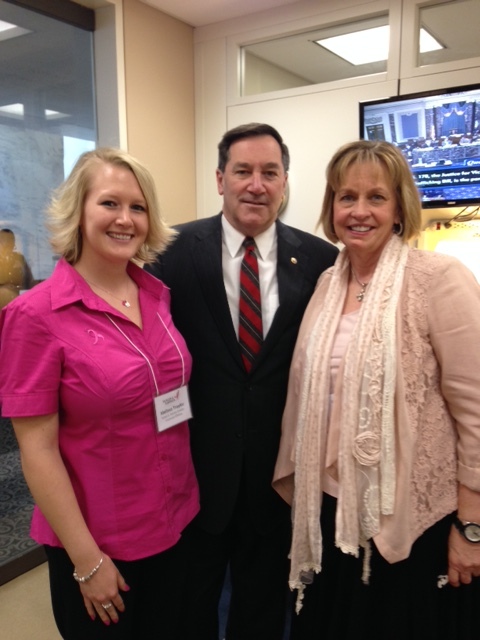 On April 16, 2015, Peggy Isenogle, Executive Director, and Melissa Traylor, Affiliate & Finance Manager, of the Komen Greater Cincinnati Affiliate, along with volunteer advocate, Donna Traylor, spent the day on Capitol Hill lobbying legislators that serve the regions covered by the Cincinnati Affiliate. This includes districts in the Greater Cincinnati, Greater Dayton, Southeastern Indiana, and Northern Kentucky areas. Current economic conditions place unprecedented strains on federal and state budgets. Susan G. Komen® is committed to empowering people, ensuring quality of care for all and energizing science to find the cure. We called on lawmakers to join us in committing to improving access to lifesaving services and removing insurance barriers to cancer treatments. The first issue we advocated for was preserving women’s access to breast cancer screening by funding the National Breast and Cervical Cancer Early Detection Program (NBCCEDP) at $275 million in the FY16 budget. The President’s proposed budget includes a 20% reduction for the NBCCEDP bringing funding for FY16 to $148 million. We asked our legislators to support the funding at $275 million so that the NBCCEDP will be able to screen half a million women for breast and cervical cancer. The NBCCEDP provides potentially life-saving breast cancer screening and diagnostic services to low-income, uninsured and underinsured women who do not qualify for Medicaid. Ensuring adequate funding to vital safety-net programs like the NBCCEDP is key to ensuring all women have access to vital screening services. The second issue we were advocating for was to ensure breast cancer patients can access the treatments they need by supporting legislation that eliminates the disparity in coverage between oral and IV anti-cancer medications. Patients should not be forced to chose a less appropriate treatment option simply because an insurer provides less coverage for a cancer drug that happens to be administered by mouth rather than intravenously. Patients and their physicians should be free to make treatment decisions based on what is best for that patient. Ohio passed this oral parity legislation in June of 2014, and both Kentucky and Indiana have also passed oral parity legislation. We were able to thank our legislators for passing the legislation in those 3 states, but also inform them that a Federal Oral Parity law is important to pass due to state legislation not covering all health insurance plans which leaves a significant number of patients without access to affordable treatment. Peggy, Melissa and Donna were able to meet with several key staff members of the Ohio, Kentucky and Indiana Senate, along with staff from the Ohio, Kentucky and Indiana House of Representatives. Everyone was very interested in what we had to say and very supportive of our cause. 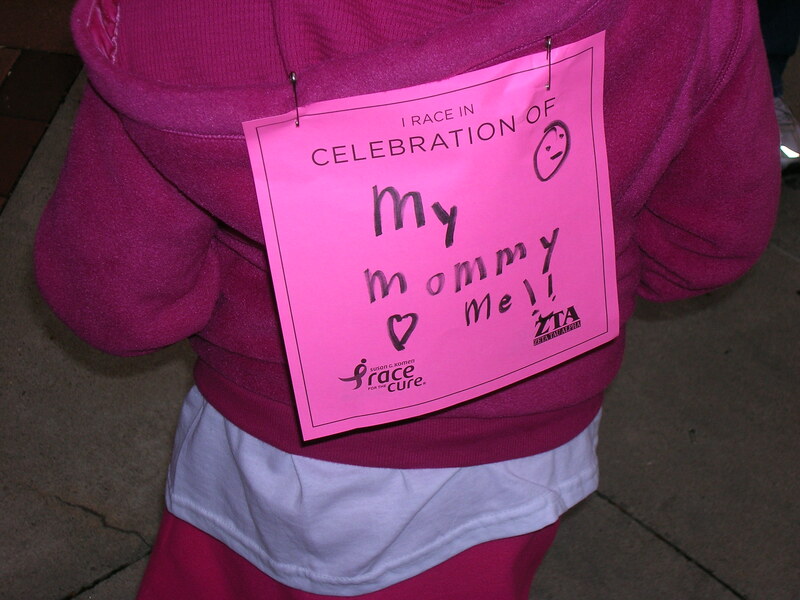 Many of the staff members have been touched by breast cancer in some way. It was great to be able to connect on a personal level with so many individuals. All in all, Advocacy Day 2015 was a huge success! We made a lot of connections and will certainly be following up with and building relationships with our lawmakers. You have the power to save a life, by simply checking a box on your 2014 Ohio state tax return. 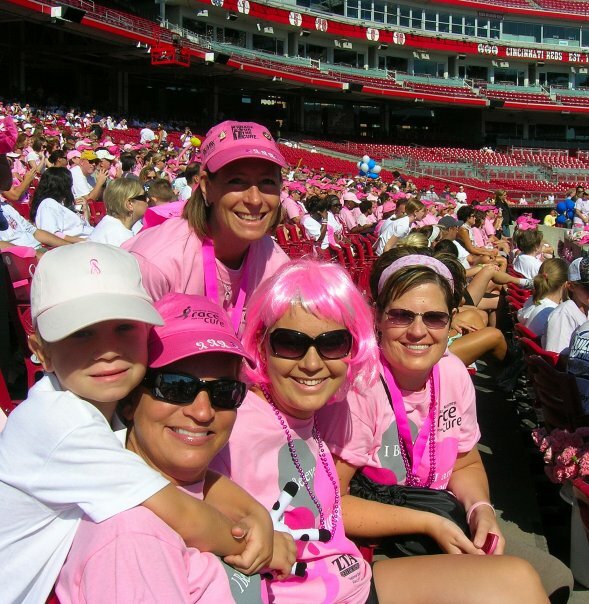 The Komen Greater Cincinnati blog is back! We will be blogging a few times a month. 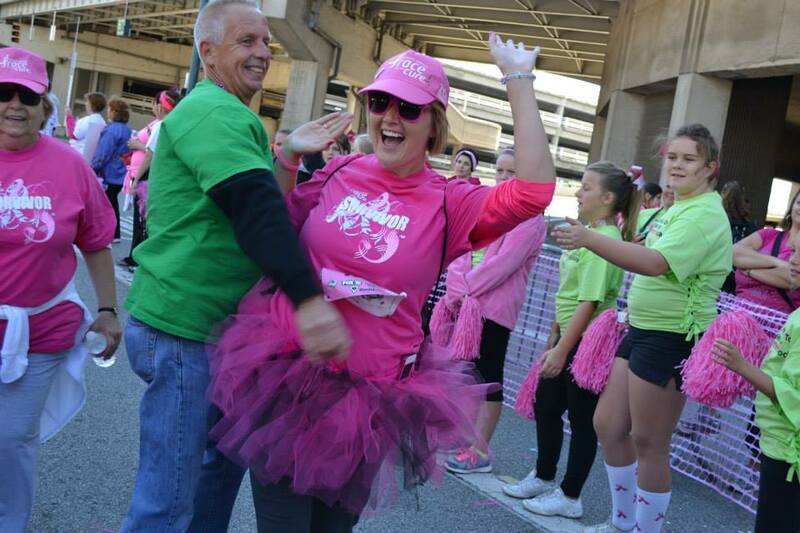 If you have an inspirational story, topic or idea you’d like to share please contact Melissa at melissa@komencincinnati.org. We’d love to hear from you! This month’s post is focused on fundraising. Enjoy! Brian Lane is 26. He works for his family’s business. 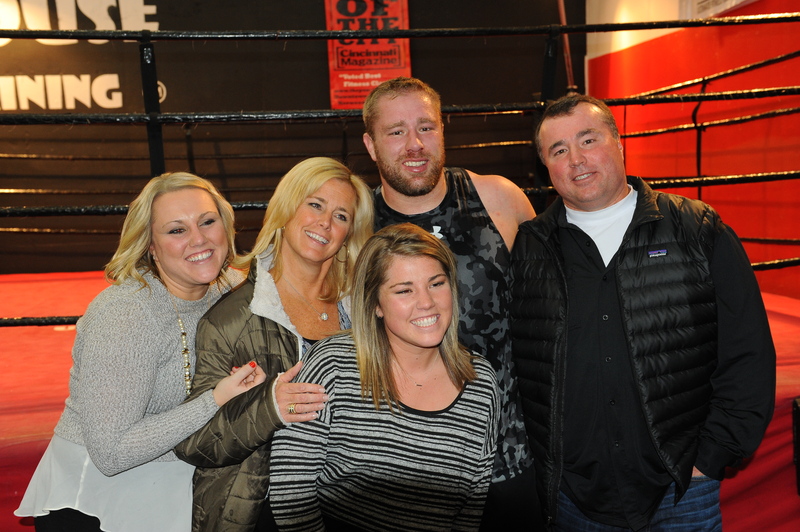 He graduated from Miami University, played football for Moeller and started boxing at The Punch House in 2012. Sounds like your average guy right? 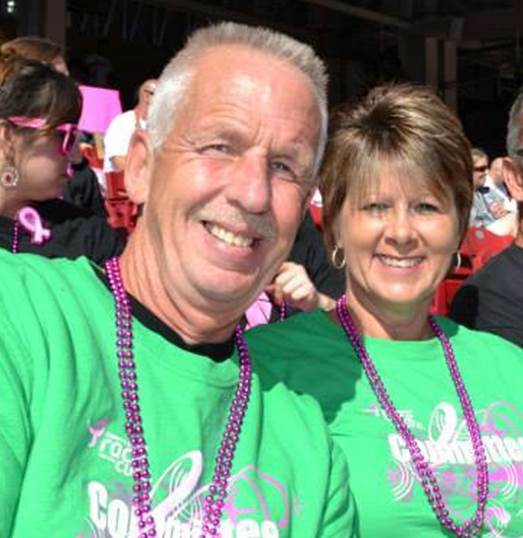 Well, this average guy was able to raise over $6,000 for Susan G. Komen Greater Cincinnati in November 2014. Brian had been boxing and working out at The Punch House since 2012. The gym was a place he could go to talk to a friend or let out all his anger while taking it out on a bag. He’d been asked numerous times to take part in a Client Fight Night. But he always declined. He was approached again in September of 2014 and this time he had a reason to say yes, he thought to himself “Brian, your mom fought and she didn’t have a choice. It’s time to put your mind to something and dedicate yourself to something bigger than you and give it your all, win or lose.” He decided that if he was going to get punched, he was going to do it in the fight against breast cancer. 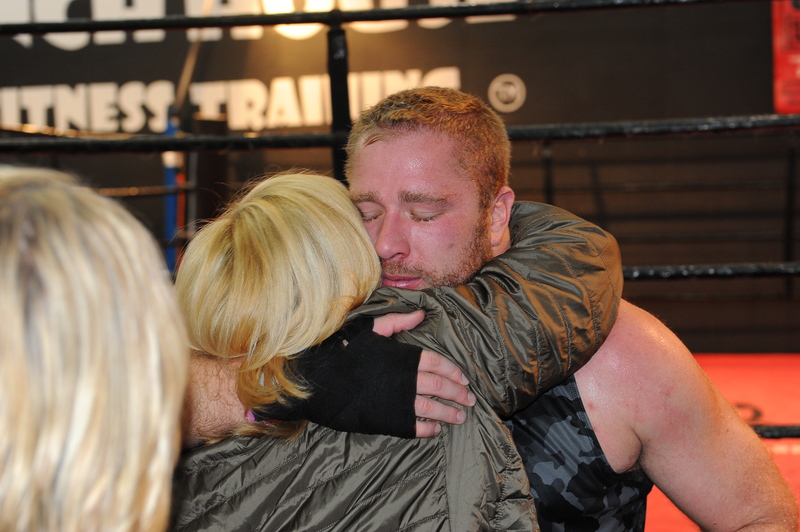 So Brian teamed up with The Punch House on November 14th to Knock-Out Breast Cancer. His goal was to raise $1,500, and within the first few days he had raised $3,000! Brian used GoFundMe.com. It’s easy to use, easy to set up and you can link it to your Facebook and Twitter accounts. That way it’s easy for friends to share, so easy that in just a few days Brian’s Facebook post about the event had close to 500 shares! His close friends and family started donating first, and then it snowballed into friends of friends, his parents’ classmates, and people he didn’t even know. In just a month he had raised over $6,000! He said he didn’t do much planning, it all just happened. 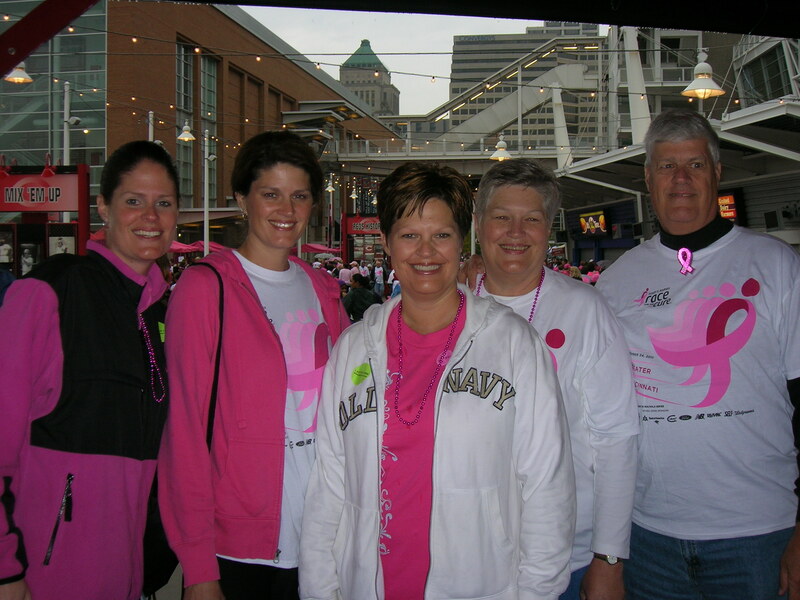 During my sister’s battle, she organized her first Race for the Cure team, one that rallied family, friends, doctors and nurses alike, to join together in celebrating her journey. This year will be her tenth year for a team. The day touches our hearts just the same as the very first race we attended. We are so proud to be in the presence of such strong women and men who have won the battle, and just as aware of the strength of those we have lost to the disease. For this is why my sister continues to join Komen in finding a cure. She too has lost a dear friend and made her a promise that she would continue the fight. This diagnosis certainly was not my sister’s plan for her life at the age of 30, but today could not imagine her life without THIS plan. She believes this has made her the person she is today and defined her mission in life. She strives to make a difference in the lives of those touched by breast cancer and hopes one day to prevent any others from the battle. She reaches out to any newly diagnosed women to answer questions, listen, and cheer them on. Jeannie has been able support and encourage our three aunts that have been diagnosed since her journey. She also helps Komen Cincinnati in any way possible. She organizes survivor gift bags each year for the Race for the Cure along with family and friends, she volunteers for many Komen events to raise breast cancer awareness, and has appeared on news programs promoting self-detection and yearly exams. She believes strongly in their cause. She has even inspired her daughter, Hope, who has had a lemonade stand raising money for the Race, remembering each dollar is another step closer to finding a cure. So this November 4th we will celebrate the life of one of the strongest people I know, my sister Jeannie. 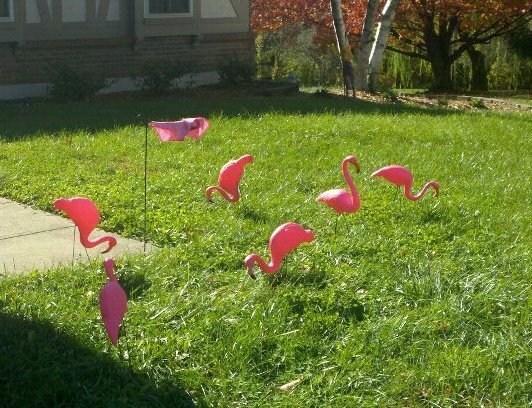 We will place ten pink flamingos in her front yard, one for each year of survival. This is an annual family ritual that reminds my sister to smile because she is a SURVIVOR. The flamingo represents grace and beauty, both of which she has displayed on her journey. She encourages others to celebrate their “day” with something that inspires them as well. We look forward to herding a flock.